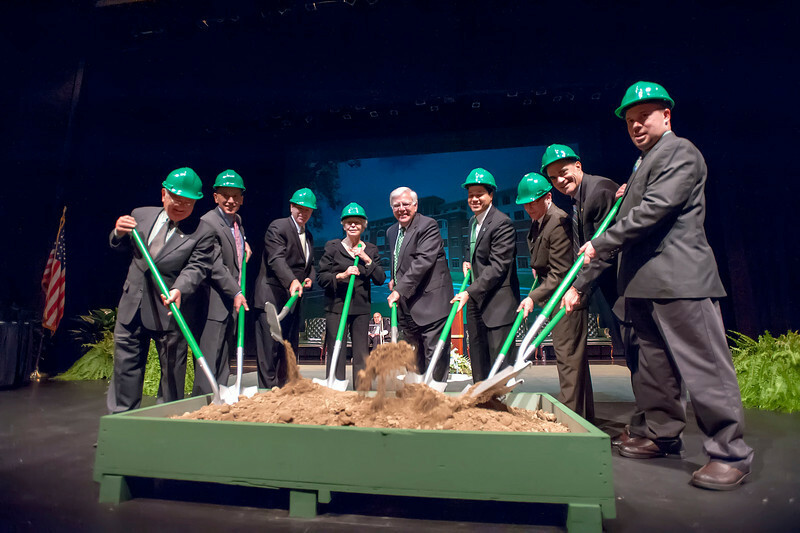 Marshall President Stephen J. Kopp, center, leads a ceremonial groundbreaking marking the start of construction of the Arthur Weisberg Family Applied Engineering Complex. The event took place in the Joan C. Edwards Performing Arts Center. Pictured are, from left, A. Michael Perry, Louis Weisberg, Sen. Robert Plymale, Joan Weisberg, Dr. Kopp, Dr. Wael Zatar, Dr. Chuck Somerville, Dr. John Maher and Chuck Moore.